After work, I checked the mail and, to my surprise, I received a letter from my paternal grandfather. He’s the family genealogist, a mantle I feel I’ll probably inherit/take up one day. He’s done a lot of work and, usually, focuses on his father’s side. Through his in-depth research, he discovered that we have an ancestor from Armagh, Ireland. This thrilled me. I remember stories of my Irish ancestors from my childhood but not the specifics. Here was a real connection. Imagine my happiness today, after a stressful day at work, of opening his letter to find information on his mother’s side. He included two photos, one of which I’ve shared at left. There are four generations there. The infant is my still-living grandfather. Holding him is my late great-grandmother. 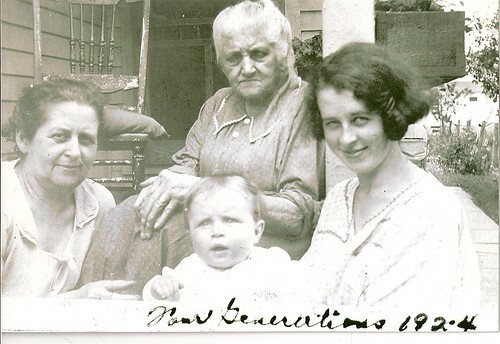 On the left is her mother, and in the back is my great, great, great grandmother who came from County Mayo, Ireland. She is the one I remember from the stories. My ancestor from Northern Ireland, Susan, came over during the Revolutionary period and lived in Watertown – my current stomping ground. This more recent ancestor is one of the many who sought a new life in America due to the potato famine in the 19th century. Her name was Mary. She was a farmer in a town called Castlebar. Ellis Island changed her last name. She settled near Utica and had a tough life but was undoubtedly strong and kept her family together. I am so proud to have her blood in my veins. My urge to go back to Ireland is even stronger now. I want to visit Armagh and Castlebar. These photos and the stories attached to them are treasures to me. I will place them in my ancestral shrine and welcome them to my home. “Holding him is my late grandmother.” I think you probably mean great-grandmother. =D She is beautiful and I think Sarah looks a lot like her! Eee! You are right! *runs to fix* Thanks for that. Yeah, Sara looks like her in that photo. There’s another photo of her as a girl and she looks scarily like me! I can really connect to what you’re experiencing. My mother seemed to concentrate greatly more on her side (Irish) than my father’s (Scots) side and now that lies within me to do, as so compelled.